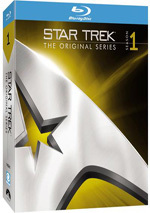 This seven disc Blu-ray collection includes all 29 episodes from Season 1 of Star Trek: The Original Series! With this Blu-ray edition of Star Trek, we get the fourth (!) release of “The Original Series” over the last decade. First came versions with two episodes per disc, and then Paramount packaged the shows into season sets. 2007/2008 provided remastered versions – and HD-DVD transfers for Season One. That remained the only high-def “TOS” until now; HD-DVD perished before Paramount released Seasons Two and Three. I’ll look at the quality of these new transfers in the tech area of this review. Since this is my fourth examination of Trek’s “Original Series”, I won’t reiterate my thoughts about the various episodes here. If you’re interested in my comments about each of Season One’s 29 shows, click here and give them a look. Back when I looked at the remastered episodes in the 2007 season set, I noted one major change: all the episodes sported new and “improved” visual effects. This meant computer-generated material more in line with current standards. This mostly affected shots of space, but some other pieces – like the fire from phasers – also got an update. Star Trek appears in an aspect ratio of 1.33:1. Some inevitable warts came along for the ride, but much of the time the shows looked outstanding. Sharpness often excelled. At its best, S1 provided stunning detail, as many shots appeared really tight and well-defined. The exceptions that occurred seemed related to the source material, so expect a bit of softness along the way. Actually, the resolution of the Blu-ray made the occasionally iffy delineation more obvious. Prior releases got away with those slips more easily, whereas the contrast between the super-tight shots and the fuzzier ones became more noticeable here. Those instances were inevitable since they’re part of the original photography. No issues with jagged edges or shimmering materialized, and the shows came free from edge haloes. Grain seemed somewhat heavy, but that stemmed from the original prints, so I didn’t regard it as a problem; this was natural grain. A few minor defects like specks, spots and marks cropped up, but these were minor and rarely became a distraction. Colors looked very good. “The Original Series” went with a dynamic palette, and the Blu-ray made the tones seem lively and bright. The grain dulled the tones at times, but the hues usually looked distinctive and full. Blacks also appeared dark and dense, while shadows looked clear and smooth. Objectively, the shows weren’t consistently strong enough for an “A”-level grade, but I could easily have gone that way. Except for some print flaws, this is about as good as Trek will ever look. 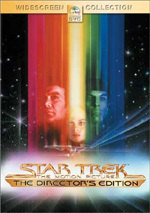 While all the prior releases of “The Original Series” came only with remixed Dolby Digital 5.1 soundtracks, the Blu-ray of Star Trek provided two English options. Finally, the suits at Paramount gave us the original monaural audio, and we also got newly created DTS-HD MA 7.1 remixes. I’m exceedingly happy to find the mono tracks here – it’s about time! That said, I expect most fans will opt for the very effective DTS mixes. As I mentioned, all earlier “TOS” DVDs offered 5.1 tracks, and these 7.1 presentations didn’t radically rework those. Many sounds came from the front right and left channels, and we also heard occasional activity from the rears. The surrounds often gave off some good ambient information - like the hum of the Enterprise - and split surround usage occurred on occasion, such as when the ship flew by or when a phaser blast headed to one side. Again, the new mixes didn’t reinvent any auditory wheels, but I thought they came across as a bit broader than the old 5.1 tracks. The audio tended to be a tad more engrossing and involving. This came from a higher level of activity, as the shows featured more material from the sides and the rears. They didn’t go nuts, however, and they remained appropriate in scope. Audio quality remained positive. Dialogue appeared reasonably warm and natural, with no intelligibility problems and only minor instances of edginess. Music showed good range and breadth, and effects came across quite well for the most part. Although some distortion could interfere with those elements, they're usually clean and they even boasted some good bass at times. As was the case with the picture, I debated whether or not I should change my audio grade from the “B+” I gave to earlier releases. I stayed with a “B+” for visuals because I thought the shows remained just a little too spotty for something on an “A” level. Yes, they looked better than ever, but I felt the various defects were a bit too strong for the shows to leap to the next tier. Although the 7.1 audio didn’t blow away the 5.1 tracks, I thought the new audio offered enough improvements to deserve a slightly higher grade. The old mixes were really good, but these offered that increase in smoothness and immersiveness that meant they merited a step up in my grade. I really liked the 7.1 audio – and I remain happy that the original mono showed up as well. When we look at extras, HD-DVD fans will find a lot that looks familiar, as most of these elements appeared on the 2007 release in that format. That includes Starfleet Access, an interactive production that was exclusive to the HD-DVD format; although the 2007 package provided SD-DVD versions of the shows and most of the extras, “Starfleet Access” was available only to those with HD capabilities. Here we find “Starfleet Access” for six episodes: “Where No Man Has Gone Before” (Disc One), “The Menagerie, Parts 1 and 2” (Disc Three), “Balance of Terror” (Disc Four), “Space Seed” (Disc Four) and “Errand of Mercy” (Disc Seven). As you watch the episodes, a few elements will appear via pop-up windows. We get text boxes that provide notes about various topics related to the shows; these include Trek details, character biographies, facts about species and equipment, and similar material to expand our understanding of the programs. We also find video clips with comments from a mix of folks. We get remarks from VFX line producers David Rossi and Michael Okuda, VFX associate producer Denise Okuda, writers David Gerrold and DC Fontana, authors/Trek experts Judith and Garfield Reeves-Stevens, Trek experts Bjo and John Trimble, VFX supervisor Niel Wray, executive in charge of production Herbert F. Solow, co-producer Robert H. Justman, Star Trek II executive producer Harve Bennett, aintitcoolnews.com founder Harry Knowles, Battlestar Galactica VFX supervisor Doug Drexler, and actors Sally Kellerman, Gary Lockwood, Paul Carr, Walter Koenig, Nichelle Nichols, William Campbell, George Takei and Grace Lee Whitney. They discuss a wide mix of topics like updated visual effects, episode specifics, and general facts connected to the series. All of these are quite interesting, though “Where No Man Has Gone Before” offers the best information since it covers so much of the series’ genesis/development. Overall, the format works well. The pop-up window trend lets us compare various elements in an effective manner, and the components fit into package in a concise manner. We learn a lot about the shows in these fun and involving features. On Disc One, we find a featurette called Spacelift: Transporting Trek Into the 21st Century. This 20-minute and six-second piece mixes show clips, behind the scenes elements, and interviews. We hear from Rossi, Michael and Denise Okuda, Justman, CBS/Paramount Senior VP David LaFountaine, CBS/Paramount TV HD Mastering Director David S. Grant, CBS/Paramount Mastering Executive Consultant Ryan D. Adams, digital colorist Don Freeman, digital restoration artist Mark DiMambro, visual effects artist Michael Carter, author/soundtrack historian Jon Burlingame, and conductor Greg Smith. “Spacelift” looks at clean-up work done for the new transfers, audio elements and the re-recording of the music, and the updated visual effects. Inevitably, this kind of program comes across as self-congratulatory since it relates how wonderful the new work was. That attitude did exist, but I didn’t mind it since the show offered good info about the changes made for these transfers. The details about new effects are especially useful since we get some good comparison shots. Disc One opens with a trailer for the 2009 Star Trek theatrical film. This also appears in the “Additional Data” area. We find an Easter Egg on Disc Two. Highlight “Communications” and click to the right to light up a red button. Press “enter” and you’ll find a three-minute and 42-second music video of sorts. This creates a reel with many of the series’ updated visual effects set to dance music. With the tagline “Boldly Go… Again”, this was created to promote the remastered shows and the modern effects. At best, it’s moderately interesting. During Disc Three’s Reflections on Spock, we take 12 minutes and 12 seconds to get notes from actor Leonard Nimoy. He talks about the reasons for the character’s popularity as well as the public perception that he hates the role. That latter topic informs much of the program as he explains his attitude and discusses his book I Am Not Spock, which he believes is the main reason for the misperception. Nimoy proves to be interesting and open as he helps make this a good featurette. Next we get Disc Four’s Life Beyond Trek: William Shatner. In this 10-minute and 27-second piece, we hear from the actor and his wife Elizabeth as they chat about their mutual love of horse riding. Horse trainer Danny Gerardi also offers some comments about Shatner. On the surface, a featurette about Shatner’s hobby sounds pretty dull, but in reality… well, it’s actually just as boring as I thought. Maybe somebody out there’s interested to hear about how much Shatner loves horses, but I’m not that person, and I found nothing compelling in this featurette. Disc Five’s To Boldly Go… Season One presents an 18-minute and 59-second featurette. We find more information from Nimoy, Justman, Shatner, associate producer John DF Black, and actors Ricardo Montalban, George Takei and William Campbell. We get some particulars about the episodes “Man Trap”, “The Naked Time”, “Devil in the Dark”, “The Menagerie”, “Space Seed”, “The City on the Edge of Forever” and “The Squire of Gothos” as well as remarks about the series’ fight sequences. It’s a very good program, and Nimoy presents the best information of the bunch. He presents great details about some shows plus some funny anecdotes. I also like the notes from the guest actors, and all of that adds up to a fine featurette. For a look at the show’s creation, we head to The Birth of a Timeless Legacy. It fills 24 minutes and 13 seconds as we see show clips, archival materials, and interviews both recent and older. We discover notes from Justman, Black, Fontana, Shatner, Nimoy, Takei, Nichols, creator/executive producer Gene Roddenberry, associate producer John DF Black, secretary Mary Black, story editor/writer DC Fontana, and actor James Doohan. We mostly get general production notes about the series’ start, shooting two pilots, casting and recasting, character development, and various bits of trivia like the creation of Spock’s ears. Trek fans won’t find anything revelatory here, but it’s a fairly decent overview of the series’ beginnings. Another Easter Egg shows up on Disc Five; you’ll find it in the same way you located the one on Disc Two. The one-minute and two-second clip is a wacky, hipster ad for the remastered programs. It’s pretty annoying. As we move to Disc Six, Sci-Fi Visionaries fills 16 minutes, 39 seconds with info from Shatner, Roddenberry, Fontana, Justman, John DF Block, and Mary Black. They discuss the desire to use noted science fiction writers instead of just TV writers, the manner in which scripts were developed, the notions behind the series’ concepts, and character issues and growth. The Blacks dominate this one, as they offer lots of good notes on the writers’ side of things. It’s a compelling and informative discussion. Next we get an Interactive Enterprise Inspection. This takes you on a self-guided tour of the ship’s exterior. We find computer graphics to depict the various spots, and narration tells us a little about them. It’s moderately interesting at best. Shifting to Disc Seven, we come upon Billy Blackburn’s Treasure Chest: Rare Home Movies and Special Memories. This 13-minute and 22-second collection provides comments from actor Billy Blackburn along with his reminiscences about working on the series as tertiary character Lt. Hadley and other parts; Blackburn also played roles like the White Rabbit from “Shore Leave” and the Gorn from “Arena”. We also get to see some of the silent 8mm film Blackburn shot on the set. The actor provides some interesting notes about his time on the series, and the footage proves fun to see. Disc Seven finishes with Kiss ‘n’ Tell: Romance in the 23rd Century goes for eight minutes, 34 seconds as it features Shatner, Fontana, Nimoy, Nichols, Takei and Koenig. “Romance” looks at the various love interests across Trek. We get some minor insights from those involved, but the show’s too brief to prove terribly involving. Returning from all three prior releases, we get preview trailers for all of the 29 shows. Each of these provides a minute-long teaser for the episode in question. As you might expect, they’re spread across all seven discs. Easily one of the most popular and important TV series of all-time, Star Trek started well and presented a good initial batch of shows, as evidenced on this Season One set of The Original Series. All 29 episodes pop up here, and while some of them fare less well than others, they offer a fine conglomeration of intriguing and inventive science fiction. The discs give us strong picture quality along with very solid audio and a decent roster of extras. 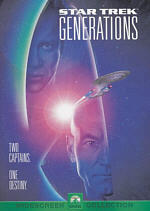 I can forgive Trek fans if they’re tired of buying – and rebuying, and rebuying – “The Original Series”. I hope they’ll forgive me for the fact that I’m advising them to do it again. Without question, this Blu-ray release of Season One provides the closest thing to a definitive presentation. It gives us the best visual and audio quality we’ve yet seen, and both areas offer choices not found in the past; this means fans can finally hear the original monaural soundtracks, and they also can choose either the source monaural audio or the new 7.1 remixes. Only in one area does this Blu-ray set fail to earn the title of “definitive”: extras. Oh, the Blu-ray package includes many nice pieces, but it drops a number of components found on prior releases. That means diehard fans may want to hold onto the earlier versions if they’re completists. If not, the Blu-ray will be the one that’ll want to own.